You need a new blender, but you are stuck between two models, the Ninja NJ600 and the Magic Bullet. Both are designed to blend and chop and let you create smoothies, summer drinks and sauces, but which one is better for your kitchen? Below, we compare the two models to help you decide which model to buy. Glance at any photo of the Ninja NJ600 and the Magic Bullet and you will quickly notice that one model is much larger than the other. The Ninja NJ600 offers a 72-ounce, BPA-free pitcher while the Magic Bullet comes equipped with two bullet-shaped cups — 12-ounce and 18-ounce — to blend in. It also comes with two party mugs and two 22-ounce travel mugs to take your smoothies and iced-coffee creations with you. If you have a small kitchen and want to reserve counter space, the Magic Bullet may be right for you since the machine takes up only as much space as a coffee mug, but keep in mind that Magic Bullet’s accessories, including two blades, will require storage. When deciding which blender is right for you, also keep in mind, that the Ninja NJ600 is able to blend family-size delights with its 72-ounce pitcher, though Magic Bullet does offer a 32-ounce pitcher attachment that can be purchased depending on the Magic Bullet package your opt to buy. While both the Magic Bullet and the Ninja NJ600 are capable of crushing ice, the two vary when it comes to how much power they have to pulverize ice, as well as other ingredients. The Ninja NJ600 is touted as having 1100 watts of crushing while the Magic Bullet has 250 watts. For those looking for a blender that can crush ice and lots of it, as well as mash potatoes, the Ninja NJ600 could be right for you, but if you are looking for a blender that has the capability to crush ice, but only in increments, go for the Magic Bullet. For those who like the simplicity of being able to use their dishwashers to clean their blender attachments, there is no difference between the single-speed Magic Bullet and the three-speed Ninja NJ600. Both blenders can withstand the heat of a dishwasher, however, it is recommended that, for both blenders, parts should be cleaned on the top rack of your dishwasher. Stay out of the microwave. The Ninja NJ600 pitcher is not microwave safe and should never be used to heat foods. However, the Magic Bullet’s tall and short cups, as well as its shaker and steamer tops are microwave safe. The systems party mugs though are not microwave safe. If you use your microwave often and want the convenience of heating up the sauces you make in your blender, you may want to consider purchasing the Magic Bullet system. But, if you plan to make a lot of soup and sauce mixtures in your blender, you might be more inclined to purchase the Ninja NJ600. You would just need to transfer your sauce and soup mixtures into a saucepan to heat. Price always plays a role in a decision to purchase a product. Currently, according to Consumer Reports, the Ninja NJ600 retails for between $88.96 and $120, and the Magic Bullet $50. There are deals, however, that can be found on both products. For example, Best Buy is offering the coupon code, MOTHERS DAY20, bringing the price of the Ninja NJ600 to $79.99 and the Magic Bullet system with the pitcher attachment is on sale at Macy’s, which is offering 30 percent off all blenders plus an extra 10 percent off at checkout. 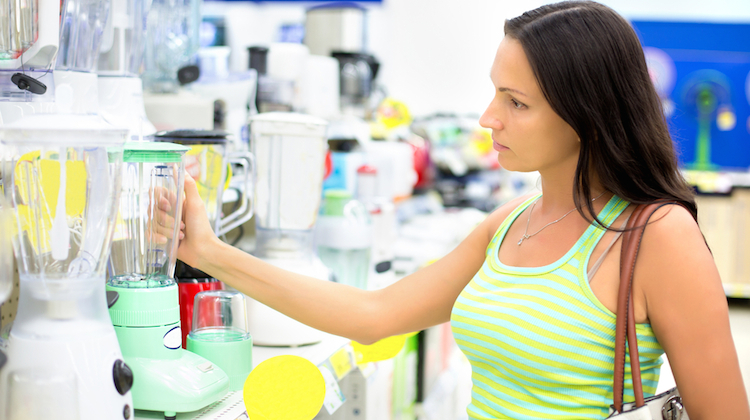 Woman buying blender image courtesy of Shutterstock.